Google Pixel vs Pixel XL: which has the better battery? Google's new Pixel smartphones are now out and ready to buy. But before you splash the cash on one, you deserve to know which has the better battery life. We weren't impressed with the battery life of the Google Pixel in our full review and the Pixel XL didn't offer incredible stamina either. 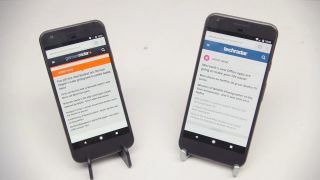 For that reason we pitted the Pixel vs the Pixel XL in our battery test to compare how each phone performs when browsing the internet, watching YouTube videos and playing Real Racing 3.